Like cool-looking guns? Get this! The T.D.P. 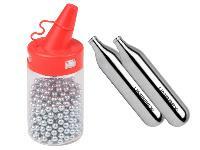 45 TAC pistol is dressed up with a bunch of accessories that take it to the next level. 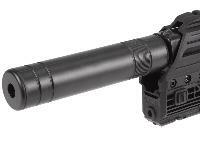 The Picatinny rail gives you an extra base for a pistol scope or dot sight. 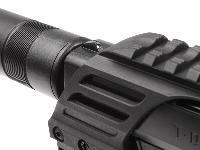 Below the barrel is a red laser that'll help focus your shots and deliver increased accuracy. The silencer is fake. It ups the tactical look but is non-functional. Things I liked: This is a song that constructed plinking pistol good magazine system cheap replacements for those magazines or if you want to add more to your kit they run about $13 in change on this and other websites everything seems to be very sound on this pistol the fit and finish it's nice as is the styling and the comfort of the grip. 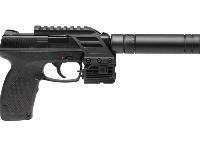 This pistol if you have it will also fit the umarex tac carbine converter kit. Things I would have changed: I would like to see it have a bit more weight I don't mind it being plastic but a little bit more weight in the hand would be pleasant. Also I'd like to make the pistol if it cannot be steel or metal I would ask that it be made out of fiber-filled nylon the same type of polymer that is used on Glock pistols. 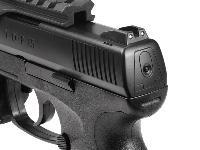 What others should know: This is a solid pistol that will definitely get you a really nice number of shots per CO2. I was able to get about a hundred and seventy five shots out of the single CO2 and that's during winter time where it's proximately 17 where it's proximately 17 where I am at. 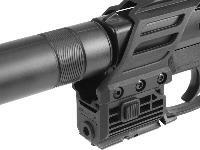 The laser even came pretty much zeroed out of the box and works very well on every other umarex product that has a rail system. However if you have products that are not umarex branded the rails are slightly off as far as being too wide don't attempt to force it or you'll start shaving plastic off your rails or paint off your guns if you attempt to use it. Things I liked: Solid construction, very quiet, adjustable laser, easy to operate magazine, reversed threads directly compatible with Tokyo Marai silencers. 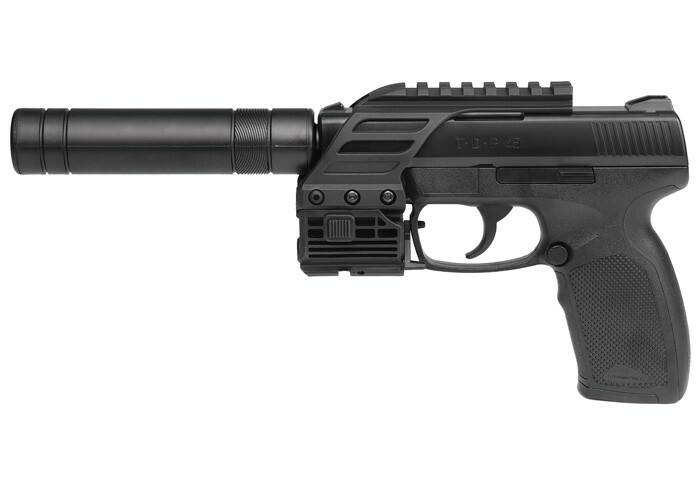 Which makes this a amazingly quiet pistol. Very good value. Things I would have changed: Took forever for it to arrive. Things I would have changed: co 2 cyllender leaks if you leave overnight. make pistol out of steel. not plastic. What others should know: when i saw the gun online i liked the way it looked. when i ordered and recieved it i saw that it was mostly plastic.gun does not feel realistic . more like a kids toy . i loaded it up with co2 and bbs and it was accurate with the laser. 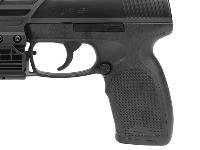 but when i let gun set overnite with fresh co2, in the morning it had ieaked out. twice i did this with the same results. i didn't want to go through paying postage to send back for repairs,soi just through it away. to bad mine is 2 mths old with original co2 and has not leaked a bit.i oil the co2 end before inserting. I have laser sight and love it. Can the rail system be stripped and removed from the weapon? Yes it can just find yourself some Allen key wrenches there are two Allen key screws on either side once loosened the entire rail assembly can come off and all you'll be left with is a TDP 45 pistol with a threaded barrel extension. 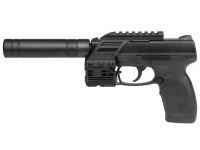 Does the "silencer" have an extended barrel inside? No it is just plastic. Not hollow either. All dressed up & ready for action!